What is the Tarptent return and warranty policy? 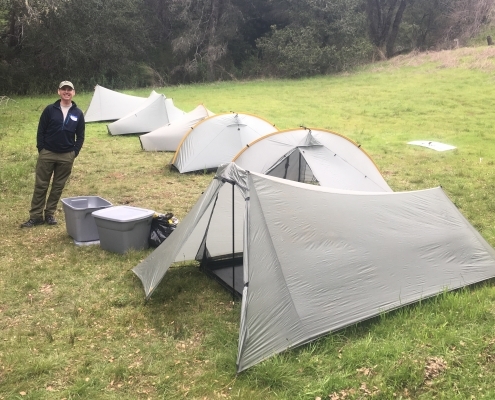 The purchaser of a Tarptent may return a new, unused Tarptent for a full refund, not including the original shipping charge, within 30 days of receipt if not satisfied. Returns involving more than one tent will incur a 10% restocking fee on all returned tents. a. The Tarptent is in excellent condition and has no visible wear, dirt, hair, or smell. b. The Tarptent shelter is returned to Tarptent neatly folded and assembled in the original condition in which it was sent. All other returns requested outside of 30 days of receipt will be evaluated on a case by case basis. If a refund is issued, the amount refunded will depend on the condition of the returned shelter. Please contact us BEFORE sending. Tarptents seam-sealed with urethane or any product other than silicone (as per the Tarptent seam-sealing video) will NOT be accepted for return. Tarptents seam-sealed by the customer will be evaluated for correct application prior to refund. Lightweight stakes are designed to be inserted and removed by hand and are not warrantied against breakage due to striking with feet or rocks. Returned stakes will be evaluated for wear and may not be given full credit. How do I arrange for repair? Please order a repair authorization. In most cases we charge only for the return shipping. How can I get a spare part or fabric to do my own repair? Please contact us. Small parts and scrap fabric are free of charge. Stakes and guylines can be found in our webstore. I have a small tear in the silnylon fabric of my tent. How can I fix it myself? Very small tears or pinholes in the roof or floor are best repaired by applying pure silicone to the wound and letting it dry. Larger tears are best repaired by coating the area with pure silicone and then gluing down a patch of siliconized ripstop nylon cut to fit the wound. Netting tears are best stitched up. Scrap siliconized ripstop nylon and no-see-um netting are available at no charge on request. Please see our video on how to patch your silnylon tent. My zipper no longer zips properly. How can I fix it myself? Zipper sliders spread apart due to accumulated dust and grit in the zipper coil. Zipper sliders can be crimped back together or are easy to replace and we are happy to send you new ones. Please refer to the slider replacement instructions and contact us for new sliders. Seam-sealing is the application of a chemical solution to create a waterproof seal over stitch seams. All seams over your shelter’s living space should be sealed with SILICONE ONLY to prevent water leakage. The Tarptent Lithium series uses Dyneema® fabric, is fully seam-taped, and does not need require seam-sealing. Do Tarptents need to be seam-sealed? We offer seam-sealing kits ($6-$8) containing premix silicone, a foam brush, and a latex glove in the webstore. We also offer seam-sealing as a service ($35). Please note that seam-sealing is weather dependent and ordering this service may add a few days to as long as two weeks to the wait time. You should be able to buy the necessary materials for seam-sealing at your local hardware store. An inexpensive product that works well is GE Silicone II clear sealer/glue. It is available as a squeeze tube in most US hardware stores. To seam-seal your tent: Set up the tent outside in a well-ventilated location. Mix two tablespoon of silicone with two tablespoons of mineral spirits(paint thinner) and then apply the solution with a small foam brush. Add more mineral spirits if the solution gets too thick and more silicone and mineral spirits as needed to maintain about a 1:1 ratio. The goal is warm honey consistency. Avoid skin contact and breathing fumes. Allow sealant to dry for several hours, ideally overnight, until the solution is no longer sticky/gummy to the touch. Allowing the Tarptent to dry outside also allows for the odor of the seam-seal solution to dissipate. Is one coat of seam seal sufficient or should I apply several coats? One coat should be sufficient. Make sure to apply a liberal coat to the ridge line and/or arch pole seam as this portion will have the greatest exposure to moisture. Make sure to pay attention to the seams around the plastic guyline extenders. Use a paper towel to clean up spills and push the solution into the seams. Temporary discoloration along the seam line may occur and indicates that the material is truly absorbing the silicone. Do I seam seal from the inside or the outside of the tent? We recommend applying the silicone solution to seams on the outside of your shelter. The exception is when you apply three or four stripes of sealant across the bathtub floor to create an anti-skid surface. Why is using Silicone so important? Why can’t I use a different sealant or tape? The only product that will bond permanently to silicone is silicone! For this reason we recommend using only silicone seam-sealing products. I’m ordering from abroad, how do I estimate the cost for shipping? There is a shipping calculator built into the online ordering system. After you add an item to the online shopping cart, click the “CART” button at the top of the page. You will be directed to “Calculate Shipping” where the cost of shipping can be calculated. If you click here, you can estimate the customs duties in your country. Please note that we cannot influence or predict customs processing times or charges. I’m ordering from Canada, should I expect to pay customs duties? We make everything in Seattle, WA and we note that on the customs forms and on the shipping box. NAFTA rules apply, so Canadian orders are subject to no duties. However, some provinces make customers pay Canadian sales tax upon arrival of the tent; you can look up the HST percentage for your province to estimate how much you will pay. Can I order extra stakes and lines? Yes. These items are available in the webstore. Other replacement items are also available. I want to check out a Tarptent in person before ordering. Can I come by the headquarters to see what they look like? Of course! We are happy to have you come in and “kick the tires” on our different Tarptents. Our staff can help you with set up in the backyard and answer any questions you may have. Please contact us in advance to schedule a time. Where can I buy Tarptents? We are based entirely in the US. We strongly value personalized contact with our customers which we believe is best achieved by providing our products directly to you. I want a forest green Tarptent. Can I order different colors or customizations? Unfortunately we are not able to accommodate custom orders for Tarptent shelters. Our shelters are made in bulk at our Seattle production facility and we are unable to do one-off manufacturing. We do not have a printed catalog at this time as we are exclusively online. Please visit our webstore to see a full description of our Tarptent shelters as well as photos, videos and testimonials. Do you offer a discount on used or blemished shelters? We offer a small price reduction on minimally blemished (“minor blem”) shelters. Blem shelters have minor, cosmetic only differences which consist of things such as extra stitch holes, small fabric discolorations, or small (patched/waterproofed) holes. These shelters have no functional/performance difference and have our standard warranty/return guaranty. Call or chat to inquire first on availability for specific models. Yes, please contact us for details/restrictions. All Tarptents are manufactured in Seattle, WA. Every shelter is assembled, checked and shipped by staff from our workshop in Nevada City, CA. What are Tarptents made of? Tarptents are made of the lightest and highest quality materials available. 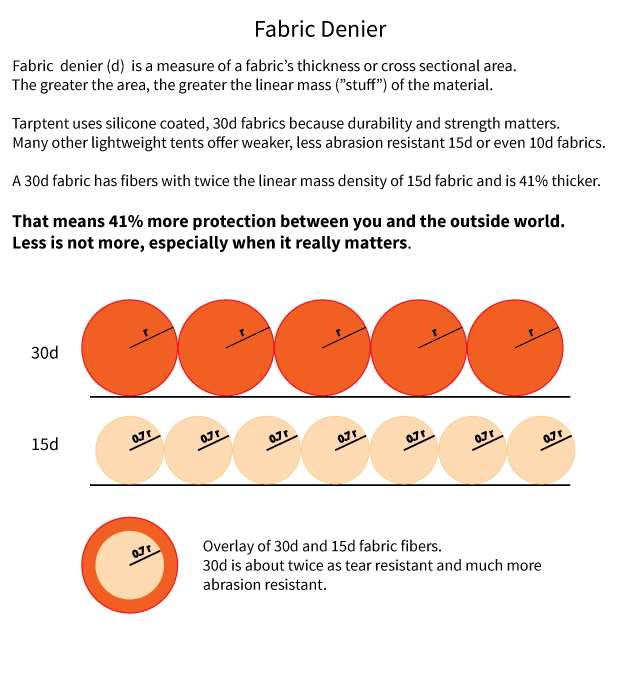 We use 30d coated fabrics for strength and durability. Roofing High tenacity, 30d, 1.1-ounce/yd2 ripstop nylon, impregnated with silicone. Final fabric weight is approximately 1.5 ounces/yd2. Netting No-see-um polyester. Fabric weight is approximately 1 ounce/yd2. Some shelters use 0.7/yd2 nylon. Solid Fabric “Solid” fabric liners and interiors are made with high tenacity, 30d, calendared 1.1-ounce/yd2 uncoated ripstop nylon. Guylines Non-stretch, 2.5-mm reflective cord with a spectra core. In a Kelty branded package, it’s called “Triptease Lightline™”. Weight is approximately 1 ounce/50 feet. Stakes Easton aluminum. Stakes are 6″ long and weigh 0.3 ounces (9 g) per stake. Some shelters use 8 3/4″ stakes weighing 0.45 ounces (13g) per stake. Poles Easton aluminum 7075-T9. Depending on the model aluminum poles may be 0.344in/8.74mm, 0.340in/8.64mm, 0.355in/9mm in diameter tubing. Weight is approximately 0.5 ounces/foot. Carbon poles are Easton 6.3 series. Groundsheet: Tyvek HomeWrap. Weight is approximately 1.8 ounces/yd2. Our Tarptent Lithium products are made from Dyneema Composite Fabric. The flys are 0.51 oz/yd2 olive drab and the floors are 1.0 oz/yd2 black. Do Tarptents come with stakes and poles? Yes. Every Tarptent comes with a stuffsack, aluminum stakes + stake bag and the necessary guyline cording. Free standing Tarptents which do not require trekking poles will come with arch poles. If you are not a trekking pole user, we offer optional lightweight and inexpensive front poles that can be ordered with the shelter. For some shelters, such as the Scarp 1 & 2, crossing poles for additional support are also available for order. Yes, we use “no-see-um” netting which stops bugs quite a bit smaller than mosquitoes. Yes, the fabric is waterproof, however the seams of the shelter need to be seam-sealed. We offer an easy-to-use seam-sealing kit as well as a seam-sealing service. Do I need to use a groundsheet with my Tarptent? Use of a groundsheet depends on the conditions you expect to encounter and your style of camping. The sewn-in flooring is remarkably tough and does not usually require a separate groundsheet. We sell optional Tyvek groundsheets which are very tough and great for sleeping out or taking a break, but generally heavier than you need for floor protection on longer hikes, in most conditions. For use on very rocky ground and desert conditions where puncture wounds are possible, a groundsheet is recommended. Why doesn’t Tarptent offer carbon poles? Carbon poles have proven to be measurably less durable than aluminum and the minimal weight savings isn’t worth it, at least in our opinion. What size do the aluminum poles fold to? Aluminum arch poles fold to about 18in/46cm. Vertical poles fold to about 16in/41cm. Can I use my trekking pole in place of a Tarptent front or rear vertical pole or vice versa? Absolutely! A trekking pole is stiff, strong and increases wind performance. Any adjustable trekking pole should work with every model. Fixed length trekking poles need to be matched to the model of the shelter. For exact heights, please check the specifications tab under each Tarptent model. What is the difference between the solid and mesh interiors in the double walled Tarptents? The solid interior is noticeably warmer and gives additional protection against the wind and cold.The white fabric of the solid interior does block the view when laying down in the shelter. The “no-see-um” mesh interior provides better airflow and visibility, which is why we generally recommend it unless you expect to encounter harsh weather conditions. Mesh interiors are made completely of mesh. Solid interiors have 2/3 solid, 1/3 mesh walls and solid roof panels. Partial solid interiors have 2/3 solid, 1/3 mesh walls and mesh roof panels. Both interior styles have full bathtub style waterproof floors. How do I choose one model over another? There is an extensive compare and contrast checklist feature on the Interactive Tent Finder page. Select various capacities and features to find the one best suited to your needs. You can also visit our YouTube page for videos on shelter comparisons and features. Do the Rainbow and Double Rainbow require trekking poles? No trekking poles are needed for either model. For free-standing setup, the Rainbow needs at least 51in (130cm) poles and the Double Rainbow needs at least 55in (140cm) poles. An additional 5cm is better for full fabric tension. Pole tip extenders can be made from PVC pipe or, alternately, aluminum trekking pole tip extenders are available in the webstore. A 6in PVC pipe extension adds 4in to the trekking pole length (since you lose 2in in the overlap). What’s the difference between the Notch and StratoSpire 1 and 2? Think of them as size regular, large, and extra large. They step up/down in weight by about 7 ounces each. The Notch sleeps one only and is a double wall, double door/vestibule version of the Moment with trekking/vertical poles instead of an arch pole. The StratoSpires offset the trekking poles for more volume and headroom and add an extra door panel to increase the vestibule space. The StratoSpire 1 can sleep two and the StratoSpire 2 can sleep three. Click here for videos comparing our solo shelters and our 2 person shelters. How important is head room to you? Would you be open to carrying substitute, foldable vertical support poles in lieu of trekking poles? Both the Notch and the Moment DW are shelters for which it’s impossible to run into an end wall. For this reason, they work well for tall people lying down. Of those two, the Notch has better sit-up headroom. The Rainbow is a single walled tent that also accommodates taller people, sitting up and lying down. How should I pitch my Tarptent in a storm? Tarptents with low ends should be pitched low end into the wind and rain. Tarptents have excellent rear protection and can be operated even without the front beak if the rain is coming from the rear or directly overhead. In side-driven rain, restake the front corner(s) as needed to lower the sidewall(s) and prevent side spray. There are also side pullouts halfway along each long side to help with side wind and rain. Put just enough tension on the sidewall to prevent it from caving in but avoid pulling the ridgeline down. In front-driven rain, deploy the front beak and move a foot or so back from the netting door. If possible, take advantage of natural windbreaks to limit front-driven rain. What is the best Tarptent for winter conditions? The Scarp 1 & 2 and the StratoSpire 1 & 2 are both 4-season capable shelters. The StratoSpire 1 & 2 require trekking poles or substitute poles and have larger vestibule space. The Scarp 1 & 2, with their optional crossing poles allow for easier, free-standing setup on snow. Many of our other shelters can handle light snow loading and can be used in combination with a solid interior for extra warmth and protection. Tarptents can be hand washed in mild soap and water. We recommend Woolite® Fabric Wash. An easier way to remove most accumulated dust and grime is to set up the shelter, soak a towel in regular tap water, and then wipe down the fabric surfaces with the wet towel. Use a circular motion and rinse as necessary. How can I avoid condensation in my tent? Please refer to the site-selection video to better understand how to avoid condensation. Try to avoid camping overnight in cool, damp environments such as river valleys, meadows, marshes and next to water. If possible, choose an elevated campsite with a bit of a breeze and preferably under a tree canopy. When condensation occurs, the best you can do is to dry off the inside of your shelter as thoroughly as possible before you take it down–a sponge or pack towel is useful for that. Give your shelter a good shake before you pack it up and use snack/lunch breaks in the sun to drape the fabric over a bush, especially if you can take advantage of breezes to accelerate the drying process. Here’s a fun little tool for playing around with dew point: http://www.dpcalc.org. Note that the dew point temperature drops as the humidity goes up. Surfaces can actually be colder than the surrounding air—note frosty roofs and windshields on morning when the temperature never hits freezing—due to radiational cooling. That’s why it’s often best to camp under trees since the foliage traps heat and keeps your tent canopy warmer. Is there a difference in condensation levels between a single wall and double wall Tarptent? Condensation happens in every tent when the temperature and humidity conspire. There’s no fundamental difference between single and double wall tents with respect to condensation formation. The difference is that, in a double wall shelter, there’s a (mostly dry) fabric layer between you and where the condensation layer forms. For our hybrid single walled tents—Cloudburst 3, Rainbow, Double Rainbow—the optional liner puts a layer between you and the underside of the roof panels. For this reason, the liner is worth carrying for trips where condensation potential is high. I lost the instruction sheet, where can I get another one? Downloadable product instructions (PDF) for all models can be found here. Can I find you at any local or national events? Tarptent has a booth at the annual Pacific Crest Trail Days. We also occasionally attend ALDHA-West events. Come say hi! How can I learn more about new Tarptent products before they are available for sale? You can visit the What’s New page of our website where we post photos, reviews and information on our newest products.